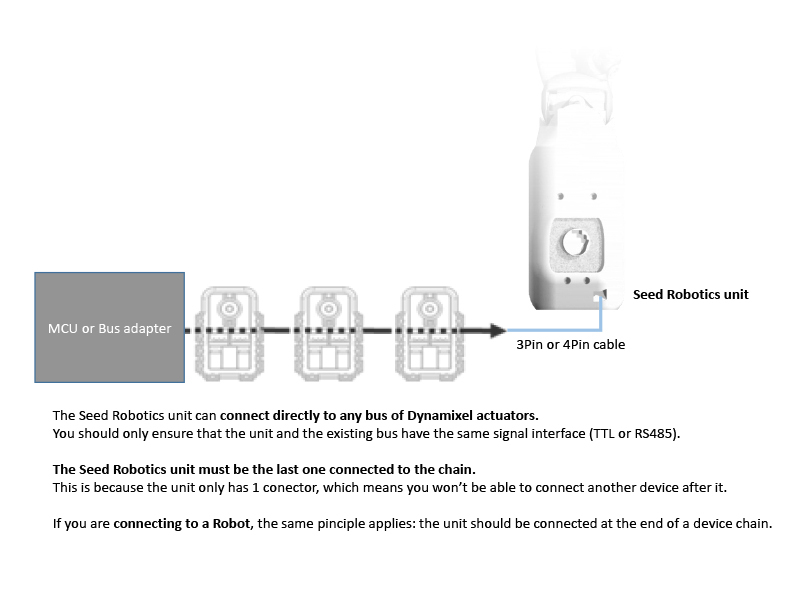 All Seed Robotics models come standard with USB interface and one main interface (the main connector), with a logical interface selected by the customer: One Wire TTL, Full Duplex TTL or RS485. In addition an Optional Bluetooth Module can be installed on the unit and connects to any terminal that supports the Bluetooth SPP (Serial Port) Profile. 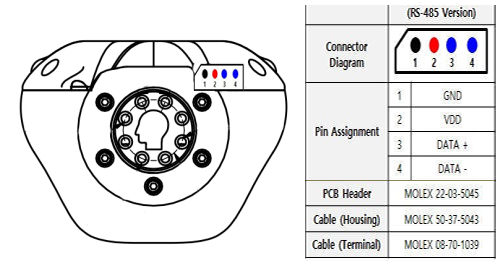 Below we detail the connector types for the units and connection diagrams with the most commonly used tools. External power must always be supplied through the main connector port (the one with the 3 pin or 4 pin connector on the back of the unit). 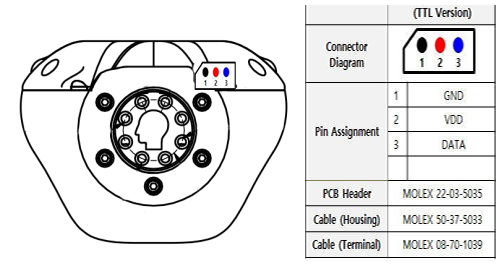 If you intend on using other interfaces for control such as USB or Bluetooth, power must still be applied through this connector on the VDD and GND pins. Acceptable voltage range is typically 9V~24V. Please refer to the documentation of your specific model for the exact voltage range accepted. The One Wire TTL Serial (UART) interface enables daisy chained connection of multiple units. This interface operates natively at 3.3V but it is tolerant to 5V, for interfacing with devices with 5V TTL logic. This interface option is directly compatible with Robotis Dynamixel AX, MX series of servos. It can also connect to XL and XM series of servos provided you create a necessary adapter cable or board to connect them. It is important to note that this connection uses only 1 wire for DATA, which means a special adapter (or appropriate code for switching TX/RX on and off) is required to control the line switching between RX and TX. The unit already includes the necessary pull-up (10KOhm) on the DATA line. The most common adapters and connection methods are shown below. The RS485 interface uses a differential pair to operate in half duplex mode. In this mode operation on a daisy chained environment is possible. 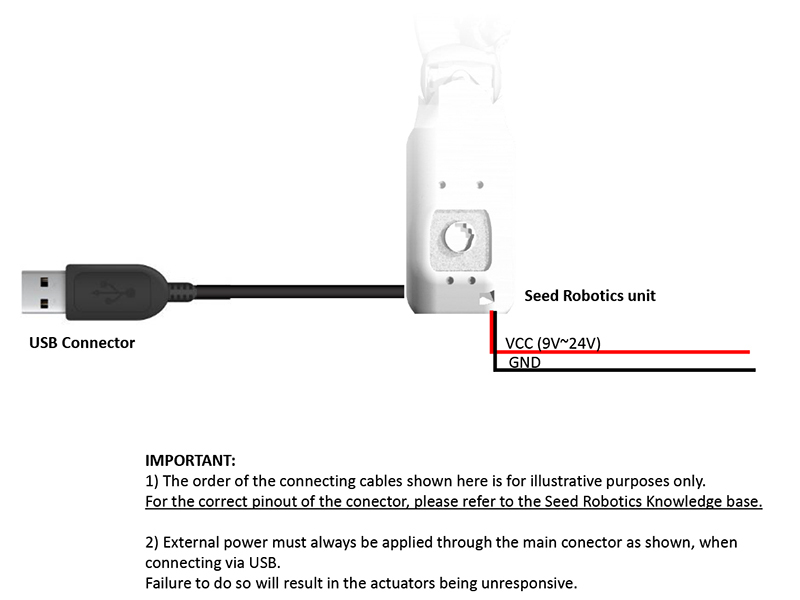 This connector option is directly compatible with Robotis MX, RX series of servos. It can also connect to XM series of servos provided you create a necessary adapter cable to connect them (the XM series uses a different connector, but the signal levels/interface is the same - RS485). 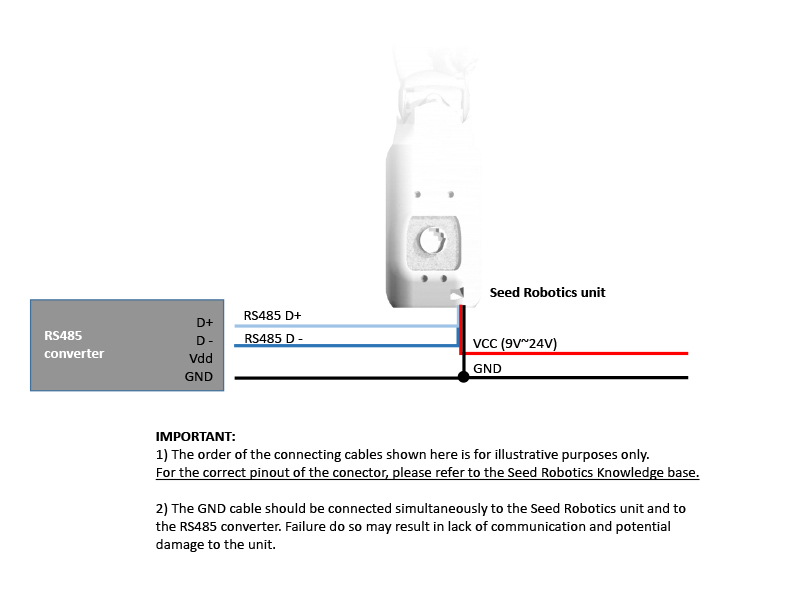 IMPORTANT: in RS485, even though communication is done through a differential pair, GND must also be connected in common between the Seed Robotics unit and the MCU. Failure to do so may result in unreliable communication and potential damage to the units. The diagram below is generic: it is designed in a way to suit all major RS485 converters. 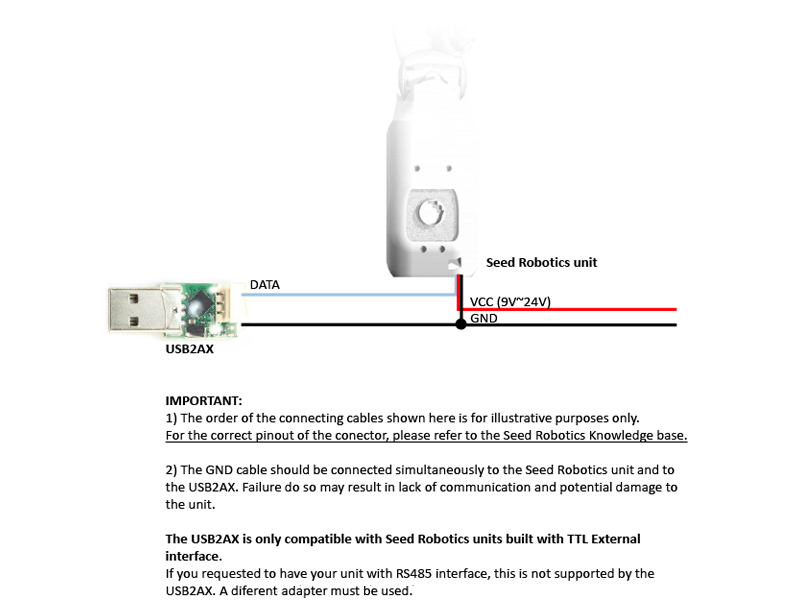 If you have any question regarding connection to your specific converter, please contact support@seedrobotics.com and we'll be happy to assist you. When selecting an RS485 converter, please observe the maximum baud rate of the converter. Bear in mind the default communication speed on the main port is 1Mbps. While it is possible to reduce it to a much lower value (115.2/57.6/9.6 kbps) for compatibility with a slower RS485 converter, we recommend 1Mbps or higher for best performance. The USB connector is available on the side of the unit (a small cover may need to be removed to access it). This connector is a standard micro-USB type connector. Once connected to the host, it will create a Virtual Serial Port. When connecting via USB, you must still apply power through the Main Connector as shown in the diagram below. Failure to do so will result in the Actuators not responding and the hand not moving as they will not be powered. IMPORTANT: you can connect via USB even if your unit is already connected via any of the other ways shown above. The firmware is capable of receiving commands simultaneously from the main connector and the USB connector. This especially useful for online diagnostics and maintenance. By default the firmware is configured to expose the USB Console over USB. This means that control using the Dynamixel protocol is not enabled by default on the USB port (although it can be enabled if required). For more information, see the EROS: Setting up the USB Connection documentation. The Bluetooth interface is an option that can be installed on your unit, at the time you place your order. The Bluetooth interface uses the Bluetooth Serial Port Profile (SPP) to create a Virtual Serial port on the remote host. IMPORTANT: you can connect via Bluetooth even if your unit is already connected via any of the other ways shown above. The unit can simultaneously accept commands through the main port and the Bluetooth interface. This is especially convenient for online, wireless diagnostics and maintenance. 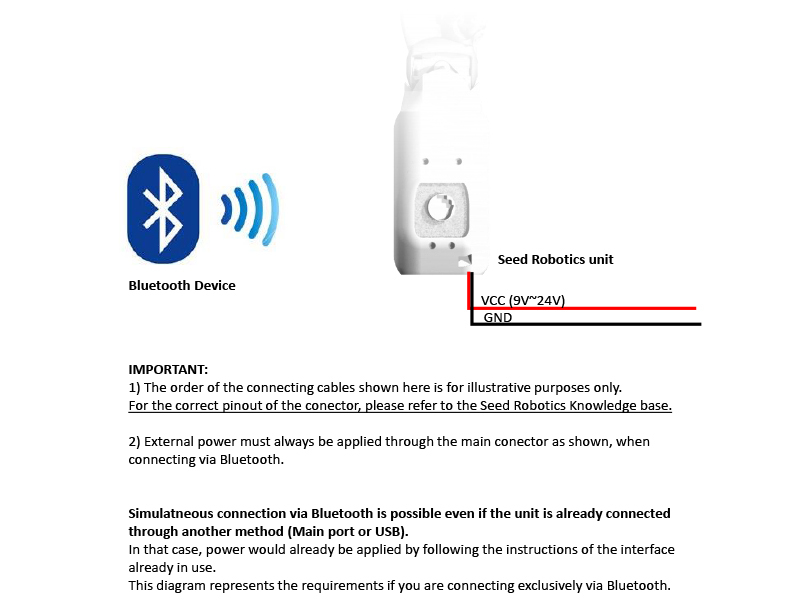 When connecting via Bluetooth, you must apply power through the Main Connector as shown in the diagram below. By default the firmware is configured to expose the Console over Bluetooth. This means that control using the Dynamixel protocol is not enabled by default on the Bluetooth port (although it can be enabled if required). For more information, see Using the Bluetooth Interface Module.